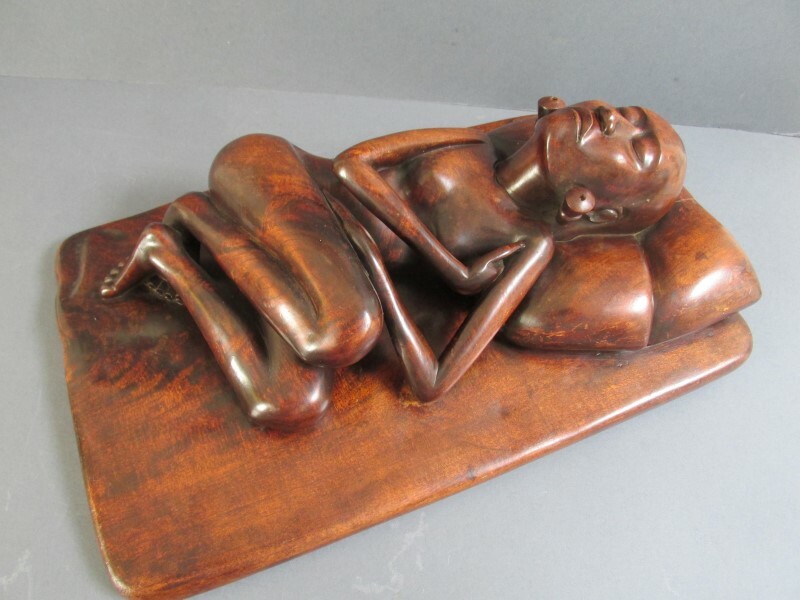 Phenomenal wooden sculpture of a sleeping woman in art deco style. Made on Bali in the 1930s. The new wave of woodcarving during the Pita Maha period (1930-1942) reaches here a high. The artist, I Made Geremboeang, is able to come up with the right solutions for the most difficult parts of the carving; pay attention how the arms and hands, traditionally the most difficult in art, are handled. Also the legs and feet are carved brilliantly. By pulling up the legs the tension in the carving is increased without influencing the intimite and subdued character of the scene. The head is not bent to one side, but looking straight upwards, giving it a good contrast with the rest of the body. The hair is carved flat and stylish, and beautifully ignored to one side of the carving. Just be aware that a woodcarver must have this form in his mind before he does the first cut! Because this sleeper is the purest example of that new art wave on prewar Bali, which Bonnet describes in 1936 as I Geremboeang being the best master of this genre, there can be no doubt that Geremboeang was the maker of this magnificent piece of art. Please click on the photo for more photos and info.